Wing in cooperation with selected Insurance partner(s) works together in providing value added benefits to inbound money transfer customers. The life insurance benefit is provided for free to the customers who send money from South Korea to their families in Cambodia into their receiver’s Wing Account. The customers can send money as normal through any of Wing International Money remittance partner in South Korea and will get the insurance worth $1,000 to protect their family financially in case of accidents or misfortune. Then, fill in the required info. 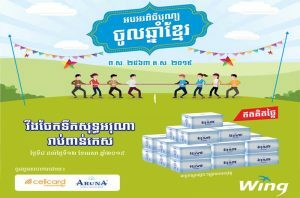 Free Life Insurance worth $1000, every time you send money to Cambodia and receive through Wing Account. Customers who use Wing’s International Money Transfer Service from South Korea receiving thought Wing Account . Only for customer who send money from South Korea to receiver’s Wing Account will be eligible. Customer must complete the digital application form provided by Wing (QR code). Customer is eligible for 1 insurance policy at a time based on the valid application. Customer can re-apply once the previous policy expires. This insurance policy is valid for 30days based on the e-policy letter provided by the insurance partner via e-mail. By using Wing Service, you hereby consent that some of your personal information provided can be used by Wing (Cambodia) Limited Specialised Bank for any appropriate purpose. What is the insurance offer? a. It is a free-of-charge life insurance provided by Wing for the customers who send money from South Korea to Wing Account Receiver in Cambodia only. The insurance will cover for 30 days with the worth of $1,000. Could I apply for this program more than one? a. Yes, you could. But you could only apply for another new policy after the previous one expires.